Home» Road Tests » Chrysler 300C Contract Hire & Leasing Review. Haven’t You Always Loved It? Be Honest. I want to find a punchy way to start this review of the new 2012 Chrysler 300C off with a bang, but I can’t seem to find the words, so I guess I’m going to opt for “the new Chrysler 300C is a simply stunning looking car that attracted more attention everywhere we went in it than cars we test that are twice the price” Yes, that will do, these are the words. We drive 100’s of cars here and so its easy to be blasé when you are asked to review a car that for the main part, few of us could never dream of owning and indeed, we don’t get blown away by the poshness of what we’ve been graciously allowed to try for a week or so. We take it all in our stride, that’s the cool way to do it. We couldn’t however help but get a little excited when Chrysler told us they were going to send us a latest 2012 model of their 300C to play with. A leviathan of a thing and we’ve always loved the look of the old Chrysler 300C and conscious of the presence it exudes as it cruises past us at the bus stop. At no time however, had we ever seriously ever considered owning a 300C, so the invitation from Chrysler was a little bit like us viewing a lady at a burlesque show where we could kind of take a look, but know we could walk away at the end of the night without having to get married. So with divorce papers tucked in our back pockets, the day arrived and the man from Chrysler cruised into our car park in this fantastically kitsch monster. So what is it? Well the latest Chrysler 300C is the love child of the relationship between Chrysler and their new owners Fiat so it’s an Italian American but it’s a big one so move over Danny DeVito, as De Niro is in town. The relationship does not end there though as whilst you’ve probably forgotten about Lancia, who packed up selling cars in the UK years ago, they are still alive and kicking in Italia and they are getting the 300C to sell in Europe as well and its going to be called the “Thema” which is a name that goes back years with Lancia and will be what the 300C will be called in most of mainland Europe. Whilst the shape is instantly recogniseable as a 300C, and whilst the car builds on the reputation of the old model, this car is actually all-new, it’s not a facelift, but it is a brand new car on a brand new platform and so absolutely deserves a second look, particularly if you’ve considered or come close to buying a a 300C before but not actually bought one. Engine wise, in the UK cleverly, Chrysler are just offering the one engine in the new 300C and that’s the 236bhp 3.0 V6 Diesel, mated to a 5speed automatic transmission (although a huge V8 petrol with an 8-speed trans is around in other countries). In the UK, there are just two models; both have the 3.0RCD Turbo Diesel and its saloon only as we understand an estate version isn’t planned for the future. The standard car is called the “Limited” and rings the tills at £35,995 on the road and to be honest, should be all any of us really need. Want to go large; well the Executive which adds bling 20” wheels, dual pane power sunroof and other toys, has £39,995 as a ticket price, but for most of us the cheaper but extremely well specified Limited will do the job. Performance wise, despite weighing in 2 tons the 300C can go from rest to 62mph in just 7.4 seconds and given an autobahn can run up to 144mph. The 300C misses out on some of the latest fuel saving technology such as start/stop or energy recuperating brakes, but despite that economy is listed as 29.4 urban, 47.9 extra urban and 39.2mpg combined and that it has to be said is pretty damn good for a car of this size and weight, but interestingly, despite the fact we were testing the car, so weren’t awfully kind to it, we found that 36mpg was a breeze to get, and that makes us believe that Chryslers claimed 39.2mpg could well be on the cards. Co2 isn’t going to impress you, but this is a big car and strangely, the Limited with the 18” wheels comes in at 185g/km, but put the 20” wheels on it, or opt for the Executive with its 20” wheels and the Co2 jumps up to 191g/km. Getting inside, well its good and you would think that it may be an anti-climax as the outside of the 300C is so impressive, and the inside couldn’t possibly live up to the expectations, but it does. Yes, it’s a wee bit American and because of that, it’s not going to be to everyone’s tastes, but frankly, that’s applies only to the dash and console, because everything else it was you might expect on an up market European car. The leather interior is nice and the seats are fat-boy comfortable and there’s lots of visible double stitching that gives an impression of quality and without doubt, it’s a comfy place to be, no matter if you are in the front or back. As you would expect, the front seats are electrically adjustable and heated, but they are also ventilated to avoid a “hot bot”. Rear seats are also heated but in all honesty, this is a four seat car, not a five seater, particularly if we are talking adults as the low roof line means there is a compromise in headroom, and foot room isn’t to cracky for that middle passenger either. Our car had the twin pane electric glass roof which was covered with a blind that kept the inside the car dark and moody, but ran part way back or all the way back at a touch of a button to let the sun shine in, whilst if you fancied a good old fashioned sun-roof experience, another button ran the glass back to half way and do you know what, we had forgotten just how nice an opening sun-roof is. Yeh, air-con is fine, but the sun-roof simply offers something wonderfully different as it allowed you to dip a toe into convertible territory. You might expect the 300C to have a cavernous boot (or trunk as the guys across the Atlantic say) but you’re going to be disappointed, as its just 481litres and whilst the rear seats do fold down so that you can poke something into the cabin from the boot, the width of the opening isn’t that big, but that said, it’s a saloon and for the main part, if four of you were going on holiday, its likely to carry your suit cases and golf bats quite comfortably. I didn’t much like the wood effect on the centre console, and whilst there’s not massive amounts of this pretend wood, I thought it looked cheap and let the cars interior down, though to be fair, after a couple of days, I don’t even notice it and nobody that got in the car, commented that they didn’t like it, so perhaps its me being picky? We loved the simplicity of the illuminated cup holders that have a chill option that reduces your can of Pepsi down to the temperature you would usually pull it from the fridge at, whilst flick the switch the other way to heat and your Costa coffee’s going to stay hot and wondered why every cup holder isn’t like that?. Nice touch that Chrysler. Instrumentation is bright and clear with the speedo and rev counter lighting the interior up in the prettiest shade of blue, although on the subject of interior lighting, unless we missed it, there was no obvious mood lighting although the foot wells had ambient LED lighting, we kind of missed something coming from the roof down, like you might get in say an Audi, or even a Peugeot 508. We can’t leave the instrumentation without talking about what I guess is the main “nerve centre” of the new 300C and that’s the enormous 8.4 inch touch-screen control panel that dominates the cars interior. Combining the biggest Garmin in the world, along with a rear facing parking camera and along the bottom an array of touch controls for radio functions including all the balance and tone functions, CD & MP3 functions for your iPod thingy, controls to sort the chilled seats and heated steering wheel, controls for the cars dual zone climate control settings, satellite navigation, telephone and more – phew. All of these are touch functions, but then lead to even more touch functions meaning that when the ignition is turned off, the big screen looks like the last peach on the shelf that everyone’s prodded but decided not to buy, because its simply full of untidy looking greasy finger marks. The Sat Nav is by Garmin, but as I said, it’s a big screen, and so its easy to see, but it kind of looks gawky, with big unrefined fonts and unfortunately (and not uncommon with many other in-car Sat Navs), it does not include fixed speed camera locations (as a normal Garmin would) so if you want to keep an eye on safety cameras (as they laughingly call them), you are going to have to have a second Sat Nav, stuck on the screen which was exactly what we did “shame that”. We didn’t and don’t like these silly handbrakes that need to be pushed down with your left foot (like they have in Mercedes) and the new 300C had just that and it’s an awful clumsy thing which saw us spend half our time trying to refit the pedal rubber which fell off every time we used the handbrake. C’mon Chrysler, so much about this car is cool, new and up to date, why on earth are you sticking with this archaic and unfriendly handbrake when there are new electronic systems that you don’t even have to mess with because everything happens automatically. Dump it for goodness sake. In terms of controls, well much of it was on the Sat Nav screen, but for the main part the rest of the “mechanical” switchgear was absolutely fine, and in common with many up market cars, the 300C offered keyless go, so that your first (and last) contact with the car was the start/stop button. Steering wheel is electronically adjustable for rake and reach and it’s also heated for those cold mornings. Like many cars now, the steering wheel houses some of the main controls for the audio system, telephone and cruise control. The cruise control standard on our car was the posh “adaptive” system, which effectively means that once its set, it decides how close its going to let you get to the guy in front and that’s a kind of weird experience as you can feel the system break the car to slow you down, when perhaps in your mind, you are up for going even closer. Never the less, it’s a good system, that whilst still very much in the evolution stage, gives you a flavour of the way in-car technology is heading. You can’t talk technology without talking safety and in addition to the Adaptive Cruise system, the new Chrysler 300C seems to have most bases covered with Chrysler claiming there over 70 active or passive systems to take care of you on the road, including curtain, side, front & rear seat airbags, a drivers knee airbag, stability control, front seat belt pre-tensioners, active pedestrian protection, all speed traction control, blind spot monitoring system (exec only), electronic stability control, forward collision warning system, hill start assist, rear back up camera, ABS and we are told the new 300C scored a full five stars when crash tested by the independent body Euro NCAP and you cant ask more than that. On the road, it was effortless and to be fair, when we first got in the car, it was a bit scary because it felt so huge that we were worried about banging its 20” bling wheels on every curb we passed. Performance, well Rolls Royce used to say performance was “adequate” and that’s exactly what the 300C delivers because it’s not a sports car and something weighing 2 tons isn’t going to be, but standing still to 62mph in just 7.4 seconds is mighty impressive and is enough to push you back in the seat and satisfy “the need for speed” for most of us. As for the cars handling, drive it a little way and you begin to get used to the cars size and begin to trust yourself not to do something stupid and whilst the steering is to be fair quite heavy, the car begins to feel nimble and begins to feel as if its size and bulk are less significant and eventually, we found ourselves chucking the car around country lanes with some abandon. Both brakes and steering are right for the car and give you confidence, but unfortunately, one thing we didn’t care for too much was the cars automatic transmission. Now we are going to probably sound mean here, but the 300C is new and it feels new, and its fit finish, build quality, range of toys and its appearance all look and feel new, but what does not feel new is the auto-box. Yes, its OK, and yes it does the job and like most modern boxes, its got the flappy paddle things on the steering wheel, but it’s a 5 speed automatic and seems old and feels dim witted, compared to the 7 or 8 speed auto’s that are around now on some of the Chryslers competition and indeed Chrysler themselves even offer an 8-speed auto box on the petrol versions of the 300C in the states. For sure, this is something that you can live with and if you leave the box alone to its own devices and just drive the 300C just as a fully automatic car, well its fine, but there are better auto boxes around and indeed Chrysler make one, it’s just a shame that you don’t get the option to have it. We found the new Chrysler 300C to be superbly refined, and in terms of build quality it improved on the old model and absolutely everything felt well screwed together and even at high speeds on the motorway, there was very little wind noise or road noise inside the cabin and the big V6 diesel stayed quietly under the bonnet whilst the tyres decided not to make any noise and the road agreed with them, making the 300C a very relaxing car to both drive and be passenger in, even over long distances such as the 300 mile journey we did in the car. So you wanna “waft” around in luxury, well we’ve got to say the Chryslers “Quiet American” fits the bill. The detractors will say it’s a big yank-tank or that it’s not refined, well they’ve clearly not driven the car, or lived with it as we did. OK, it’s maybe not as refined in every single aspect as some of the German models, but many of those lack refinement as well and they can learn a trick or two from the many areas of the 300C believe me. Yes its brash, but it’s a great brash and it’s the kind of car that if you are invited to perhaps a wedding of an old friend that you’ve not seen for some years and turn up in the 300C, he’s going to think how well you’ve done for yourself. Because of its parentage, people might feel the big Chrysler shouts Chicago gangster and would look right on the set of Soprano’s and maybe that’s true to an extent, but it’s still got that real kind of Bentley look about it (a motor trader who saw our car in fact thought it was a Bentley!) and that gives the 300C a “regal” air, it gives it a sort of up-market British-ness that perhaps it shouldn’t have and that frankly most other prestigious cars (particularly the German ones) don’t have. Will you buy one? I don’t know, but perhaps you should, because if you want something that’s a bit left field and really different and if you want more than an anonymous German brand that to be honest you see on every corner and that no one really ever gives a second glance to, well the Chrysler 300C does it and to be honest, does it better than pretty much anything else I can think, particularly for its ticket price. You can get as badge snobby as you wish, but there is no doubt that the Chrysler 300C oozes luxury and is a great cruiser, although it’s size means its not as nimble as some of the more common German competitors. But if you want something different, want something more special, more unusual, something that makes a statement and something your friends are going to want to travel in, yet which still stacks up financially and still stacks up even as a company car and to be fair, could possibly be something that’s a once in a lifetime experience, go out and splash the cash on this prettiest of big saloons or ask us to lease you one. 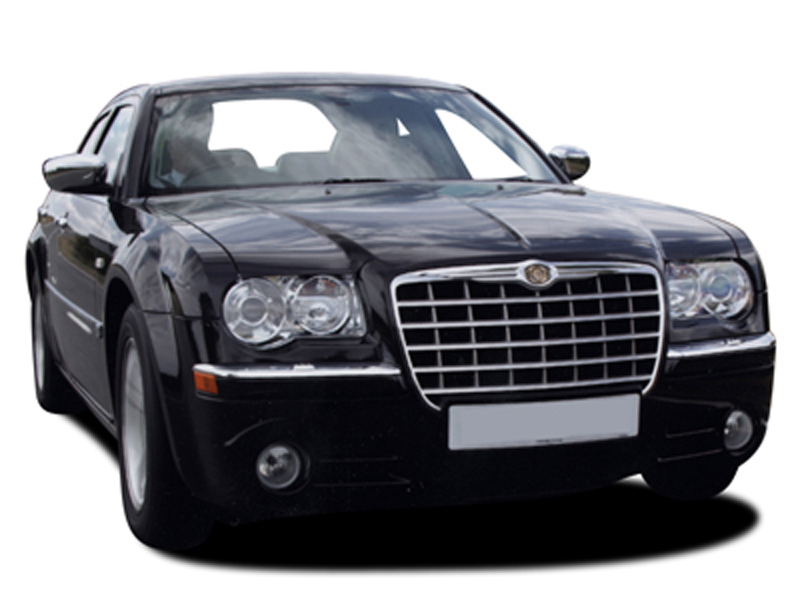 For a quotation on the Chrysler 300C or any other Chrysler, please do not hesitate to contact us.